A sunset lit the stage as Havana Cuba All Stars, also known as Asere, began their concert at Hancher Auditorium on Thursday, March 14th. The audience settled into their seats, anticipating a pleasant concert that would transport them to Cuba, but the All Stars didn’t let the audience sit in silence for long. Clapping, standing, and dancing—the group asked a lot from its audience. By the end of the show, couples were dancing in the aisle. Some of the audience members were waving a Cuban flag. One mother was jumping up and down between her kids, shaking her head back and forth. It was an entertaining sight, seeing the audience enjoy the music to its fullest extent, but it took some convincing from the band to get the audience to loosen up. The spotlight shines on the dancers as they proudly end their performance. Photo by Gabby Estlund. The All Stars were joined on stage by the dance group Identidad. These dancers brought the lyrics to the stage, telling a visual story with each melody. The band joined in on the action, doing simple steps while playing. The act of sidestepping or cha-chaing with the music changed the tone of the show. This was more than a concert, it was a performance. A quarter of the way through the set Michel Padron, musical director and first trumpet, took a second to address the crowd. “It did not feel like Iowa,” he said of the first portion of the show. It was true. After four songs fully sung in Spanish, complete with dancers and lighting changes, Hancher Auditorium transformed into Cuba. All that was needed was the salty smell of the ocean and a light sea breeze. As the performance went on, the atmosphere of the auditorium shifted. The audience gave in and began to party—Havana style. Lead vocalist Ricardo Fernandez rapped in “Debajo de un Alamo.” This contemporary style change was common during the All Stars’ performance. “Mercedes” was by far one of the prettiest songs of the night for it was a love song that briefly changes to a reggae style. The lights faded to red, green, and yellow with the music, completing the experience. The All Stars perform Cuban music with a mixture of traditional and contemporary styling. As expected with Cuban music, drum solos were as common as trumpet solos. A Cuban band is only as good at its percussion section, and the All Stars were spot on. During “Mi Changui,” the performers formed a half shell around soloist Yoan Sanchez on the bongos. Behind Sanchez a laid-back kick line formed. The All Stars’ main goal when they perform is to spread happiness, in any way possible. “Today it is very important for people to enjoy live music,” said Padron. “It is very easy for people to create music with computers, but that music is not always good.” The All Stars put on a show, and seeing them perform live is crucial to get the full experience. 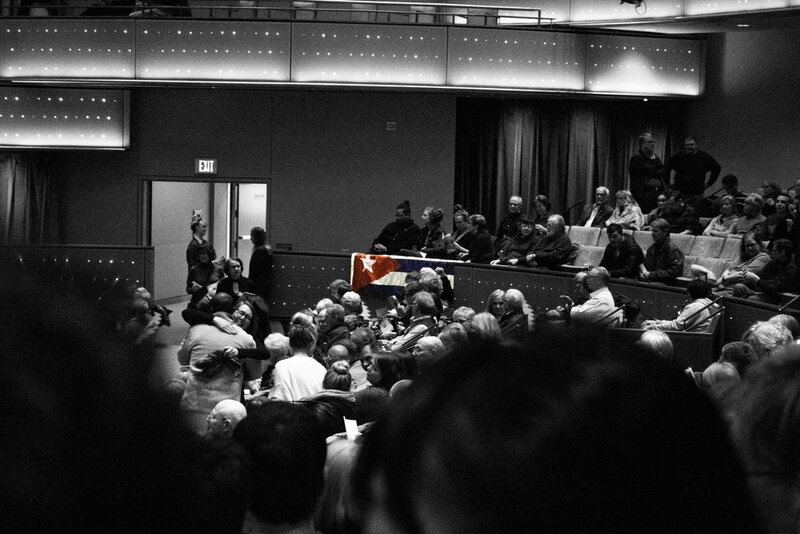 Members of the audience display the Cuban flag. Photo by Gabby Estlund.